Ann describes her jewelry as "design driven by material and process, influenced by local landscape and produced by hand from start to finish." 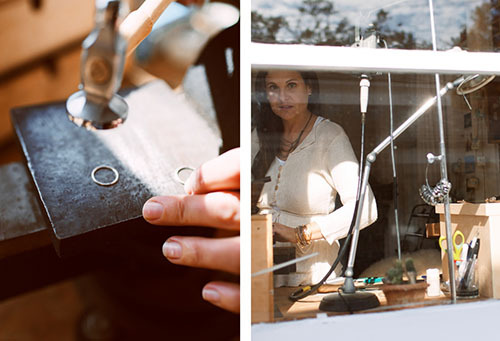 Her jewelry line is comprised of entirely US recycled and refined metals. As you'll see, she cares deeply about texture and high quality construction. Ann added, "The aesthetic of the work is handcrafted and recognizable which sets it apart from other brands." Ann currently has two different collections of her jewelry, Delicate and Aqueous. Each collection has its own personality. Ann, "The catalyst of the delicate collection was really elemental shapes and forms while the aqueous collection was inspired by water and classic jewelry designs." Ann's previous jobs have included a pastry chef, audio engineer, floral designer and metal worker. She has always been a busy bee with her hands and has certainly found her calling as an accomplished jewelry maker and designer. I like how each piece resonates her thoughtfulness- her individualism and passion. Her rings may be my favorite. The top stunner is an 18k and sterling nameplate ring while the bottom is the lovely tidal ring. This is the one I tried on when I met Ann and realized I couldn't take it off. I had to buy it. It was mine. Ann's best sellers are her bangles, the ebb and the ridge. They each have their own incredible look and feel and are quite stunning when stacked together. See all of her bangle offerings, here. This necklace is as beautiful as it is labor intensive, often taking Ann a full week to make just one. It reminds Ann of her own southern upbringing- "At some point in a young woman's life, she is typically given a pearl necklace for a monumental birthday, graduation, etc, and that was the idea behind my version in brass." With my Ann Ladson ring still on my finger as I write this, may I encourage y'all to check out her site and indulge in all the gorgeous pieces and pics. 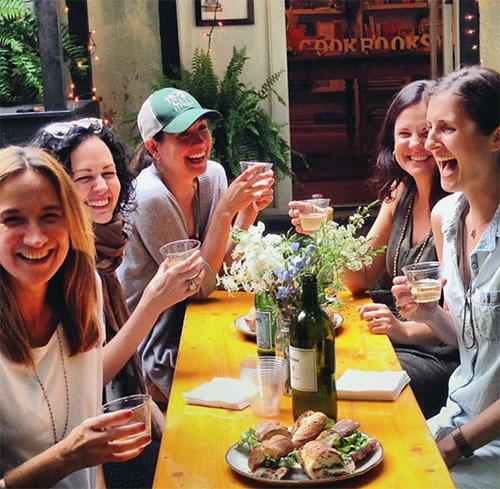 I love meeting talented women in the South who are hard working and creative and strong and inspirational. In its own way, meeting Ann and all these wonderful women last week is a reminder of the true strength and beauty of women. With each glance of my ring, I hope to be reminded of just that.